are not your body, not your job, and not your smile. You are not your hair-do, not your car or clothing style. You are not the times you lose. You're not the times you win. You are not your bank account or the pimple on your chin. You are not the food you eat or ball-point pen you push. You are not the things you buy or the the dimple on your tush. What you are cannot be seen as form try as you might. Yes, you have a body and possessions you collect. You may belong to private clubs with manners so correct. Yes, sometimes you have a cold and maybe have the flu. But all that stuff is not the stuff that really is who's you. You're so much more than what appears to be within your sight. You are not your problems that seem so very real. You are not your set-backs or successful business deal. You are not the weight you lose or weight you hate to gain. You are not the blues you sing or thoughts that bring you pain. You are a light that shines as you, an illuminated star. is what you really are. What you are can't be described 'cause worldly words are trite. less than you were born to be, automatically. with no limits as your core? It's YOUR mind that knows no limits. Is that human? No, that's more! your Self that you forgot. than all the very best in life. That can be quite a mess. when Infinity is your source? Does that mean you're awesome? Your bet it does......of course! or wherever you might go. that has no worldly care. or guru that you hire. that brings a big life WOW! ? but where you are.....right now! and feeling in utter despair. and ready to pull out your hair. and remember the who that you are. or someone whose head is ajar. is a picnic for what's within you. it might even give you the shakes. but what's going on with you. is what it is you think of you. I swear it is no lie. come back to you as people for you to judge some way. as people that you know and conditions that you see. Life is just a mirror, what you see is what you are. Within the framework of your mind your truth is never far. about how helpless or empowered the you you think is so. 'cause what you see is only what it is that you perceive. about all aspects of yourself quicker than you can blink. Let's suppose someone you know is really way 'far out'. That person is an idiot. To you there is no doubt. No matter what that person does they do to your dislike. What are they doing in your life? You wish they'd take a hike. may somehow think this person is just tops and swell and great. They see someone that you don't see, no ifs, no ands, no buts. When they don't see the same as you you're sure they must be nuts. about the people in your life, are about the you you feel. Or take a situation that you're sure is such a bore. Someone else who's in that spot may see opportunities galore. 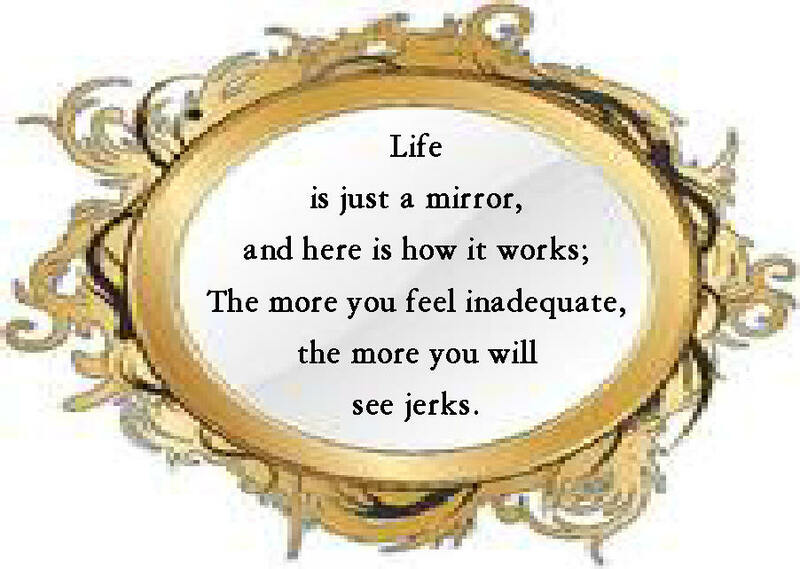 Yes, life is just a mirror. That may be hard to grasp. That news can be real freeing or a real pain in the asp. for you to make adjustments when you comb your hair and groom. to touch-up a mirror's image. The thought is downright dense. to get and see more out of life it's you that has to change. Life is just a mirror. Not today, but everyday. And as you know you're special everything appears that way. you first must see much more of that in the you you see. There's nothing wrong or lacking in what you call your world. Your world is just a mirror, unfolded and unfurled. the more you will get out of life and the better off you'll be. Are All That Really Mattertudes In The Scheme Of Things. Optimistic attitude? To some that may sound square. To think that life could be so sweet. For them too much to hear. is 'cause your pessimism blocks answers from your sight. screws up your life in many ways from your head down to your toes. you'll go oy vey, climb the walls, and surely go insane. gives you a great advantage over all adversity. to keep you on a course that's grand. Don't dare say that you can't! and peace of mind went South. just pour from out your mouth. but wind up in the dumps. that may seem out of whack.